The world’s natural wonders are major tourist attractions. Everyone wants to be a witness to the beauty of this planet, and water-based scenes are some of the most popular. Around 71% of the earth’s surface covered in water, meaning you don’t have to go far to see something mesmerising. As leading experts in domestic and commercial water treatment, we know great water when we see it. We thought we’d dedicate this post to revealing the most stunning water-based locations in the world. 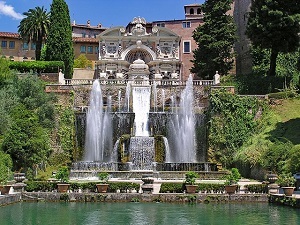 Recently awarded a top spot in our rundown of wonderful water gardens, Villa d’Este in Tivoli, Italy, is an exquisite example of garden design in the Mannerist style. The retreat may be man-made, but it uses the natural beauty of water to create a magnificent scene. The garden was designed for the Estes as the ultimate escape from Roman life. Granted UNESCO World Heritage status back in 1979, the Plitvice Lakes National Park in Croatia is one of the country’s most popular attractions – and for good reason. The National Park consists of sixteen lakes in total, each as beautiful as the last. Nestled in dense woodland and connected by a series of waterfalls, the Plitvice Lakes offers a little slice of paradise just a stone’s throw away from the major cities of Zagreb and Zadar. With its aquamarine waters, Verdon Gorge is one of the world’s most stunning gorges. Located in Provence, France, you can swim – the gorge is a great place to practice a number of exhilarating water activities – or climb to enjoy views from down below or up above. From one colour to five, the Caño Cristales is commonly referred to as the ‘River of Five Colours’ or, more simply, the ‘Liquid Rainbow’. Located in Columbia, the river is famous for its many colours, which change with the seasons. Its red colouring, for instance, only appears at certain times of the year, generally between late May and late November. It is the flowering of red algae that causes the colour change. Don’t want to choose between seeing a stunning lake, a beautiful river or a mesmerising waterfall? You don’t have to when visiting Jiuzhaigou National Park in China’s Sichuan Province. This diverse natural wonder is series of lakes, waterfalls, and rivers. The Pearl Waterfalls in particular offers a picture-postcard image.